Life expectancy is increasing in most countries and has exceeded 80 in several, as low-mortality nations continue to make progress in averting deaths. The health and economic implications of mortality reduction have been given substantial attention, but the observed malleability of human mortality has not been placed in a broad evolutionary context. 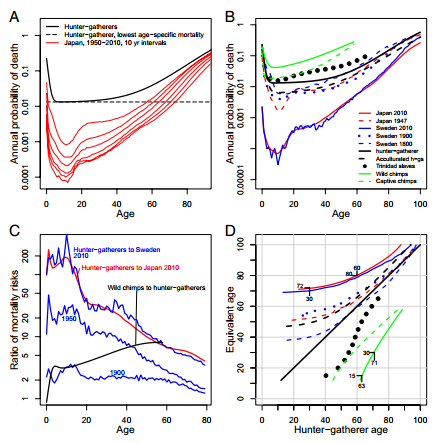 We quantify the rate and amount of mortality reduction by comparing a variety of human populations to the evolved human mortality proﬁle, here estimated as the average mortality pattern for ethnographically observed hunter-gatherers. We show that human mortality has decreased so substantially that the difference between hunter-gatherers and today’s lowest mortality populations is greater than the difference between hunter-gatherers and wild chimpanzees. Moreover, mortality improvement in humans is on par with or greater than the reductions in mortality in other species achieved by laboratory selection experiments and endocrine pathway mutations. This observed plasticity in age-speciﬁc risk of death is at odds with conventional theories of aging.